This Sony microphone is great sounding, handy, and an elegant solution for reproducing realistic, accurate sound. This Sony microphone is an excellent selection for all your sound recording needs. If you'd like to have accuracy, precision, and reliability, the Sony F-V620 has what it takes. You can reliably pick up resonant bass notes and shimmering treble frequencies as this dynamic microphone features an excellent 70 Hz to 16 kHz frequency response. At 11.7 ounces, the Sony F-V620 is portable, allowing you to confidently tote it in your sound kit to events or live performances. 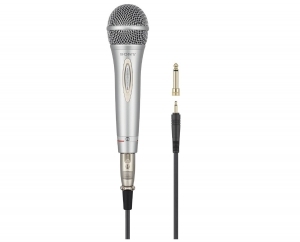 This Sony microphone is intended for live performances, allowing you to get the most out of it for miking front men, a capella groups, and choirs. With the unidirectional pattern on this dynamic microphone, you can catch subjects in a studio, sound-stage, or auditorium. Moreover, the Sony F-V620 is quite sensitive, with a -55.8 dBm effective output level, which means you are able to catch all kinds of different sound levels.